14.04.2011 » Messi: "Cristiano Ronaldo adapts everywhere and scores lots of goals"
Lionel Messi talked about Cristiano Ronaldo and José Mourinho, in a sort of preview to the four Real Madrid vs Barcelona matchups. The Barcelona player admits Cristiano Ronaldo has an ability to adapt wherever he plays and always scores plenty of goals. Barcelona's biggest star, Lionel Messi, spoke to the press and praised both José Mourinho and Cristiano Ronaldo. The Argentinian player is confident Barcelona will be succesfull in the decisive moments of the season and is anxious for the 4 "Clasicos" Real Madrid vs Barcelona to be played in the next 3 weeks. Real Madrid and Barcelona will play this weekend the first of four matches scheduled for the next 18 days. Spanish League, Copa del Rey and UEFA Champions League are being contested by the two Spanish Giants, and the World's expectations about this rivalry is bigger than ever. Messi spoke to the Italian press "Ansa", and admited Cristiano Ronaldo is a decisive player for Real Madrid. Messi: "Cristiano Ronaldo has a lot of ambition and a true eye for goal. Wherever CR7 is, he adapts well and scores plenty of goals. ", said "El Pulga". Regarding José Mourinho, Messi believes the Portuguese coach is the perfect choice for Real Madrid: "Mourinho is the perfect manager for Real Madrid. People may like him or not, but he's a true winner." Lionel Messi also commented the recent critics about his performances for the Argentinian National Team: "I get bothered when people doubt about my dedication for Argentina, because of things that have nothing to do with football. Happily, everything got better and I'm fine now." 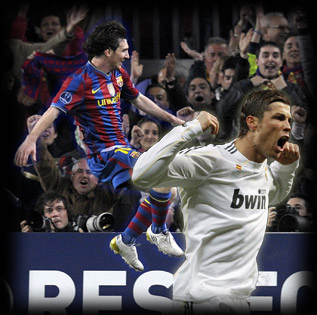 Remember that you can watch Real Madrid vs Barcelona livestreams, online here on ronaldo7.net, this Saturday. Cristiano Ronaldo is expected to play, but further news will be released tomorrow.